Another high school football season officially kicks off Friday in Orlando and there are plenty of things to be excited about. The region should produce several squads that have a chance to make it to Camping World Stadium and compete for a state championship. The biggest storyline entering the year is whether Dr. Phillips can win back-to-back titles in 8A or if they will be unseated by Wekiva. Also, teams like Jones and Winter Park have to prove that they can fill in the gaps on their rosters to remain local and state contenders. Let us take a look at these questions and other major headlines as we preview the Orlando high school football season. After making a run to the state semifinals a year ago and coming up short against Dr. Phillips, the Mustangs are the unquestioned area power entering 2018. Their defense is loaded with players who will take the field for major programs at the next level, with at least five guys likely to sign with Power 5 schools. 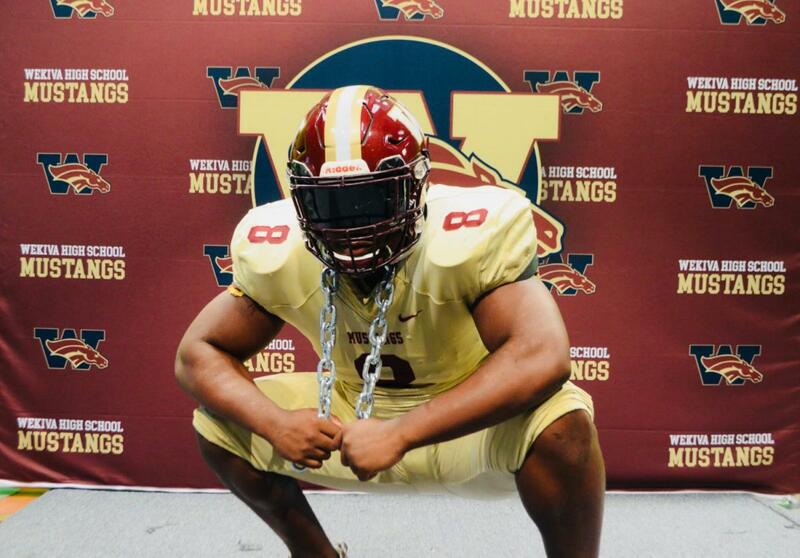 Last year's 12-2 team is buoyed even further by the addition of transfers Rian Davis and James Lynch Jr. Wekiva clearly has their sights set on finishing the deal and securing a state championship in 2018. The Panthers finally got over the hump last year, celebrating their first state title after defeating Delray Beach Atlantic 17-7 at Camping World. The journey will be tougher for DP this year after losing nine starters on offense from a year ago. West Orange transfer Brendan Cyr slots in at quarterback and he will try to keep the scoring attack afloat. The defense is suffering from graduations in the secondary, but they have a stout linebacking corps led by Cameron Williams and twins Jaquarri and Japerri Powell. The Blue Darters were an uncharacteristic 8-4 last year, but still made it to the regional semifinals. They have an experienced group of juniors led by head coach Rick Darlington's son, QB/RB Jackson Darlington. Senior running back and ECU commit Cornelius Williams is the featured playmaker in the Apopka offense. Despite all their talent, the Blue Darters will be tested by a daunting schedule that features state powers like Lakeland, Dr. Phillips and Jacksonville Mandarin as well as district matchups against Wekiva and West Orange. The Eagles completed a remarkable program turnaround, going from winless in 2016 to a 9-3 record and district title last season under new coach Cameron Duke. They are led again by the area's top quarterback, R.J. Harvey, who is committed to Virginia. Edgewater has 15 returning starters, highlighted by talented junior running back Isaiah Connelly. On defense, Nate White is an imposing pass rusher who is drawing interest from several FBS teams. The Warriors return plenty of skill talent from a team that just missed out on the playoffs after a 7-4 campaign in 2017. They arguably have the region's best offensive player, wide receiver Darrell Harding, who is committed to Duke. Senior quarterback Elijah Stimmell is back to get Harding the ball as well. West Orange will have another tough road to reach postseason play, but the schedule presents several opportunities for signature victories. Bishop Moore at Edgewater, August 24, 7 p.m. The high school season is kicking off with one of Orlando's top rivalries, the "Battle of College Park." Bishop Moore and Edgewater are within walking distance of each other, but there was a 21-year hiatus in this contest until it resumed in 2013. The Eagles lead the all-time series 15-5, but they have not won a game since getting the Hornets back on the schedule. This may be the year they break that losing streak. While rivalry games are always important, the Hornets may have a more critical game to look at when the Tigers come to visit. Whoever wins this game will be the District 5A-13 champion. Jones lost plenty of talent, but they still have three players on defense with FBS offers. However, Bishop Moore's experience and the fact that they are playing at home might be enough to put them over the top. Wekiva at Dr. Phillips, October 5, 7 p.m. This is potentially the best matchup of the season in Central Florida, with the area's two most-talented squads squaring off. These teams split games last year, with the Mustangs winning a 14-0 game during the regular season, but the Panthers ultimately triumphing with a 28-7 victory in the 8A state semifinal. Winter Park at Boone, October 19, 7 p.m.
District 8A-3 should be decided by this mid-October showdown. The Wildcats won their second straight district title last year and reached the regional final, but the Braves also held their own, advancing to the regional semis. Winter Park has just five returning starters, but the late transfer addition of senior running back Peter Hayes-Patrick could make a huge difference. Whether Boone's experienced defense slows him down will probably decide who wins this one. Apopka at Wekiva, October 26, 7 p.m. This rivalry of neighboring schools has been a one-sided affair over the years, with Apopka winning the first ten games after Wekiva originally opened in 2007. That all changed last year when the Mustangs clinched their first-ever district title with a 22-14 road win. There will likely be major stakes on the line again with District 8A-4 hanging in the balance. Davis spent his freshman season at Wekiva, before relocating to Texas for two years. He is back in Central Florida for his senior campaign and committed to Georgia this summer. Rivals and 247Sports both rank Davis as one of the top 100 players in the Class of 2018. Davis has a final a final four of FSU, Miami, Ohio State and Clemson that he will make his college decision from. 247 has him ranked as the tenth best defensive tackle in the class, while Rivals has him at #15. Tillman Jr. became a surprise commit for Texas when he made his decision known this summer at a team camp in Austin. Both major recruiting services consider him a top 100 player in the state. Green has been committed to FSU since the spring. The Seminoles have had great success with defensive backs in recent memory, so he could have a great shot to become a star in Tallahassee. Sorrells is another late addition to the Winter Park roster, transferring over from Largo. He is an Under Armour All-American and has over 20 college offers. Sorrells was previously committed to Florida, but South Carolina may have the current inside track on getting him to sign.